Cottage Delight’s Peppered Steak Sauce contains a special blend of pepper and spices, certain to turn up the heat of your favourite steak. Cottage Delight Table Sauces are traditionally made in small batches using only the finest ingredients at our Staffordshire Moorlands. 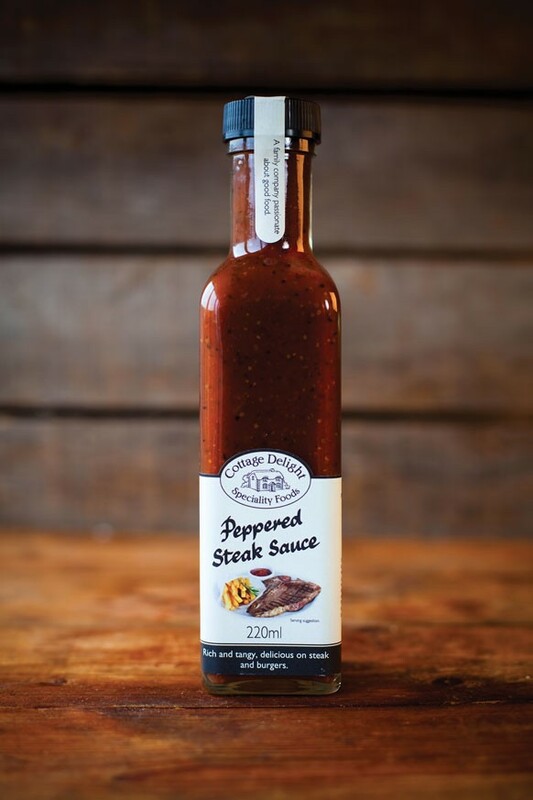 Peppered Steak Sauce is deliciously rich with a strong peppery flavour made using wholegrain mustard and cracked black peppercorns. Try Peppered Steak Sauce with grilled meats and poultry, as a dip or accompaniment to meat pies, or stirred through gravies and casseroles for added luxury flavour. Made in England. INGREDIENTS: Tomatoes, Onions, Sugar, White wine vinegar, Dark Muscovado sugar, Concentrated tomato purée, Wholegrain mustard (Cider vinegar, Mustard seeds, Water, Sea salt), Balsamic vinegar (White wine vinegar, Grape must, Colour: Sulphite ammonia caramel, Preservative: Sulphur dioxide), Cornflour, Black pepper (1%), Salt, Garlic purée.